Angelino Heights is one of the oldest neighborhoods in Los Angeles, California, situated within neighboring districts of Chinatown and Echo Park. This neighborhood is known for its concentration of eclectic architectural styles from three eras: The Victorian, Turn of the Century and Revival eras. The Angelino Heights neighborhood is situated on a hill of about 502 feet in elevation, located within the Echo Park proper and west of Chinatown. 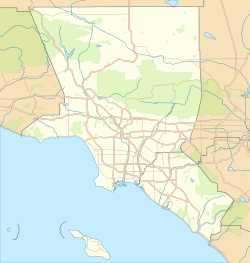 The neighborhood's boundaries include the 101 Hollywood freeway to the south, Sunset Boulevard to the north and east, and Echo Park Lake to the west. Sunset Boulevard is the main thoroughfare that connects and services all three districts. 824 East Kensington Road, Los Angeles, CA, Angeleno Heights, was designated as Los Angeles Historic-Cultural Monument 223 on June 6, 1979. This Queen Anne Victorian home with Moorish and Eastlake influences, was built in 1892. The location was soon the epicenter of the Los Angeles Oil Field and became surrounded by oil derricks. The home was moved to Angeleno Heights in 1900 and was the first home in the neighborhood to have electricity. Originally spelled Angeleno Heights, Angelino Heights is second only to Bunker Hill as the oldest district in Los Angeles outside of Downtown. Founded in 1886, it was originally connected to the downtown mainline (which ran east to west on Temple Street) by the Temple Street Cable Railway and later by streetcars. Like Echo Park proper and Chinatown, it is known for its steep hills. The district contains many notable examples of Victorian architecture, particularly of the Eastlake and Queen Anne styles, and though found throughout the neighborhood, they are especially concentrated on Carroll Avenue. Two of these residences served as the houses used for the TV shows Charmed and Journeyman, used in the shows as San Francisco Victorian residences, and because of the picturesque nature of the neighborhood, they have served as the backdrop for countless motion pictures from the earliest days of cinema to the present. Traveling around the neighborhood, one also discovers that many other styles of architecturally significant homes are to be found here, such as Craftsman, Bungalow, Mission Revival, Art Deco, and Colonial Revival, to name a few. A large swath of Angelino Heights was destroyed to build the Hollywood Freeway, which cut it off from Temple Street save for an overpass at Edgeware Road. 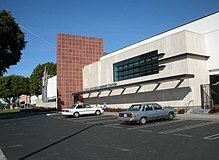 The Los Angeles Police Department operates the Rampart Community Police Station, which was located at 2710 West Temple Street, 90026, serving the neighborhood. It has since moved east into a newly constructed facility at 1401 West 6th Street, the site of the former emergency receiving hospital. The house that sits at 1345 Carroll Ave in Angelino Heights is known as the Sanders House and is most famous for being featured as the spooky setting for Michael Jackson's Thriller music video.The 3,532-square-foot Queen Anne style house was originally built for a local warehouse operator named Michael Sanders in 1887. The Sanders House was also featured in a Season 4 episode of Charmed, as well as the movie Teen Witch (1989). Angelino Heights is zoned to Los Angeles USD schools. All residents are zoned to Plasencia Elementary School. Some residents are zoned to King Middle School, while some are zoned to Virgil Middle School. All residents are zoned to Belmont High School. ^ a b City of Los Angeles, Planning Department (10 June 2004). "Angelino Heights Preservation Plan". preservation.lacity.org. Retrieved April 20, 2018. ^ "Angelino Heights Topo Map, Los Angeles County CA (Hollywood Area)". TopoZone. Retrieved 2018-04-21. ^ "Rampart Community Police Station - Los Angeles Police Department". www.lapdonline.org. ^ a b "Scene It Before: The Thriller House Los Angeles Magazine". Los Angeles Magazine. 2014-10-30. Retrieved 2018-10-08. ^ Mena, By Jennifer. "Preserving L.A.'s past in Angelino Heights - Los Angeles Times". latimes.com. Wikimedia Commons has media related to Angelino Heights, Los Angeles.